Didn't James Murphy talk about this before? Okay not exactly. "A new generation of music lovers is starting to groove to the sweet sound of vinyl records, reviving sales of the kind of turntables their parents used to own. A lot of older technology has been swept away by the digital age, but old-fashioned analog audio is still alive. Record and turntable sales indicate there is new interest in the sound of vinyl." Click to read more at the Washington Times. (Editor's note: lamest title for an article ever - and he used groove again in the first sentence...). And they mention the turntables that have USB ports to convert the vinyl to MP3 but then why buy the vinyl in the first place if that was your intention? Of course there are those hard to find releases that seemingly only exist on vinyl. And fans that have every version of every release. I don't know what it is, but there is something else that attracts people to vinyl. Myself included. I hear that you and your band have sold your guitars and bought turntables. I hear that you and your band have sold your turntables and bought guitars. Speaking of relevancy (or staying relevant), superb minimal tech artists, Beckett & Taylor have a new release, (World of Me) (with the parenthesis, it is not a punctuation error) and were kinda enough to put out their own remix of the title track called Me Too. Check out more at their record label, Hand on the Plow. 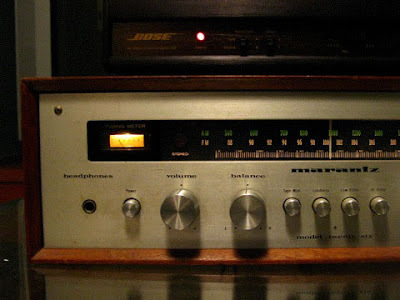 Check out the Marantz Model 26 (1973) that I am refurbishing. It works perfectly minus some scratching if you try and adjust the volume or balance. But if you leave it alone... amazing. (yeah that's a Bose 901 active equalizer above it...) The irony is that the source that transmits to this setup is all digital. Here is a YouTube video of the original version of World of Me. No video, just audio.